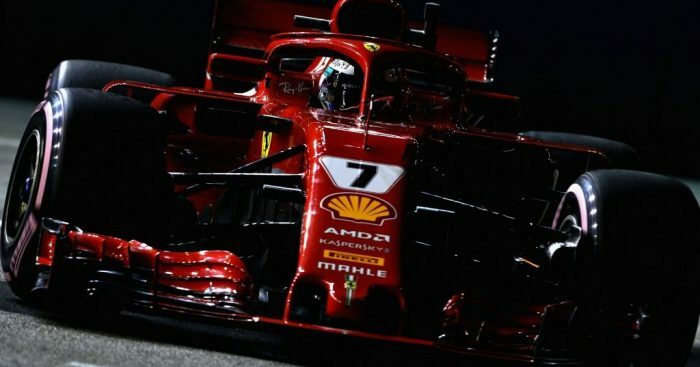 Kimi Raikkonen topped the FP2 timesheet by 0.011 seconds in Singapore, while Sebastian Vettel finished P9 due to a brush with a wall. Raikkonen pumped in a 1:38.699 during his qualifying simulation programme with Lewis Hamilton right on his tail after recovering from a couple more lock-ups. Vettel was on course to become the fastest driver of the session until he got a little too close to the barrier on his hot lap and was forced to abort. When he brought the Ferrari car back into the pits, it began to leak coolant which kept him firmly in the garage for the rest of the session and down in P9 on the leaderboard with just 12 laps completed. After a 1-2 finish in FP1, Red Bull duo Max Verstappen and Daniel Ricciardo dropped down to the second row while Carlos Sainz, Romain Grosjean, Fernando Alonso and Nico Hulkenberg completed the top 10. With darkness descending on the Marina Bay circuit, conditions in FP2 were much more representative of what the drivers will face both in qualifying and in Sunday’s race. FP2 picked up where FP1 left off, with Red Bull and Ferrari squabbling over top spot on the initial night runs with Mercedes duo Hamilton and Bottas down in P5 and P6 respectively. It was the Sauber-bound Raikkonen who set the early pace with a 1:40.510, but Verstappen, Ricciardo and Vettel were all nicely poised behind as just a tenth separated the top four, all running the ultrasoft tyres. Mercedes came to life a little more on the qualifying simulation runs despite Hamilton and Bottas both having moments off the track. Raikkonen improved to a 1:38.699 after switching to the hypersofts, with Hamilton just 0.011 seconds off the pace. Vettel’s first hot lap on the hypersofts was ruined by the German brushing the barrier with his right-rear tyre. He immediately came into the pits, where his SF71H started to leak coolant in the pit box. Back on track, it was Red Bull now occupying P3 and P4 with Verstappen able to extract a tenth more than his team-mate Ricciardo – but half a second down on the leading Ferrari. Down at the bottom of rankings after the qualifying simulation runs was a familiar name in Williams. All the drivers, minus Vettel, then knuckled down and got on with their long-run programmes. Bar a spin from Marcus Ericsson with 10 minutes left on the clock, narrowly avoiding Fernando Alonso behind, the high-fuel runs breezed by without incident. Both Raikkonen and Hamilton were unable to keep the hypersofts in their optimum window for long during their race sim runs, with Ricciardo showing very good, consistent pace on the ultrasofts.